Horizon's Kindergarten Math - My Daughter Loves It! Horizon’s Kindergarten Math – My Daughter Loves It! We are two days into our school books, and Carrianna is already at lesson seven in her Horizon K math book. She adores it. I don’t hear any complaints from her when I say it is Math time! We previously had tried Math U See Primer book, and we did around 10 lessons of the book. 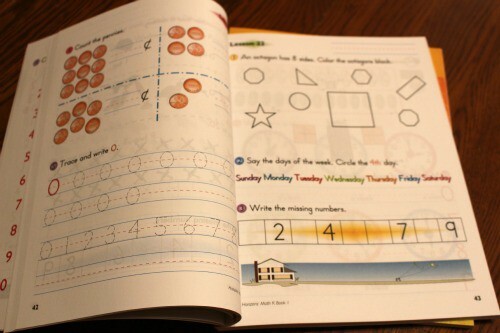 I had used that math book with my older two boys with good success. Somehow I could tell it just wasn’t going to be as good of a fit for Carrianna. I wanted something set up a little bit more like a traditional Kindergarten math book, complete with some simple pictures and a variety of different types of problems. 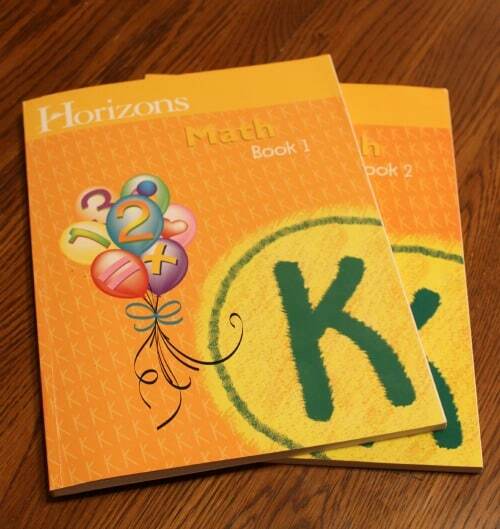 I had previously looked at Horizon K math several times but the price always stopped me. I finally took the plunge this time, and I’m so glad I did! What helped me with the price tag is that I read several people saying you really don’t need the teacher’s manuals with the K level, so I just bought the workbooks. After looking through the books I think we will do ok without the Teacher’s books. Horizon is known to be a bit advanced, but Carrianna (age 5) loves math so I thought she would be able to handle it. Her only struggle so far has been writing the number 2, which has been a struggle for awhile now. 🙂 She is quickly picking up on how the problems work, and what comes next in the book. This math book teaches a solid beginning in math with these topics: counting, adding, and subtracting single digits, money values, time and days of the week, direction and positions, and shapes with color recognition. By the end of the first book they are counting by 5 and 10’s, reading graphs, using number lines, counting pennies, nickels and dimes, and adding a double digit with a single digit. Horizon uses a spiral approach, which means the concept is taught in one lesson and appears in the next few lessons. Then it will be reviewed for the next month or two in a few lessons. I’m very particular about pictures in curriculum , and since I’m married to a graphic designer that makes two of us that are particular. 🙂 I don’t like loud, silly pictures that distract a child. The graphics in Horizon’s Math are perfect, just the right amount of color to add some interest to the page, but not enough to totally distract a child. I anticipate using this same curriculum with Olivia when she hits Kindergarten, as she seems to love her numbers as well. It is a great program and I highly recommend it! As a member of Timberdoodle’s Blogger Review Team I received Reward Points in exchange for a frank and unbiased review. « Hair Styling Products I Use As A Busy Mom! 3 Comments on Horizon’s Kindergarten Math – My Daughter Loves It! Really love the Horizons Kindergarten math and phonics. I used them for my first 3 children- moved away from it with my fourth and will be using it again for my 5th. I’ve just had good results with it. 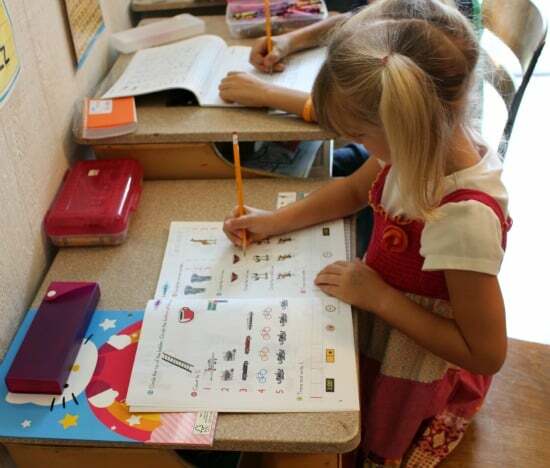 I agree that for Kindergarten you don’t need the teacher’s books. I agree about graphics. I’d rather something have no pictures than a bunch of distracting ones. I’m getting ready to start Brett in this workbook in 1st grade and plan to let Anna work slowly through the kindergarten book as she likes! I agree with you– good pics and I think the spiral method will work well for us. I bought mine from Timberdoodle (best price! Love Timberdoodle!!) but I did buy a used copy of the K teacher’s manual for $4 from Amazon (free shipping with other purchases). My kiddos aren’t old enough to share my enthusiasm just yet, but I am so excited to start working through these!